This old cabin cruiser is a long way from home, moored down at Bursledon pool, she was built for the sheltered waters of the Norfolk Broads and area of flooded wetland in the east of England. I've passed her many times thinking she was just a displaced riverboat, until I spotted the name "Lady Beryl". I remembered a boat of that name on the Thames during the 1980's, I think she was kept near Old Windsor and was reputed to have been owned by Gorge Formby the actor and entertainer and named after his wife. Some research suggests she is in fact the same boat, built in 1950 in Wroxham, custom-built by Windboats, designed by Graham Bunn and one of the largest Broads cruisers ever built. George Formby and Beryl cruised the Norfolk Broads during the 1950s. The boat was sold around 1960/61, since when she has had a number of owners and more recently was used as a houseboat. I went over Lady Beryl a few years back when a friend of mine was interested in buying her. She's a nice boat with lots of expensive wood and a huge cabin in the stern. But only one prop so won't be particularly manoeuvrable. There are pics with G. Formby on board. Your right about the manoeverability, She wont turn to port whatsoever at slow speeds. I kept her in Deacons for a year or so, which is where I found her. I took her across to Cowes, and she's awaiting a spot in the Classic Boat Museums workshop for a full refit, before I take her back home to the Broads. My parents owned her for a time back in the late 70's. They purchased her from one of the directors of Smith's crisps just along from Bray. loads of charachter, expensive wood and history. After a few years they sold her on. Would love to see her after the re-fit plus will see what old photos I can dig out. Graham Fenton / musician / Isle of Wight regarding boat Lady Beryl 1987 almost purchased her in 1987 Grand Union Canal Northolt Middlesex. i have many fond memories of when my father owned her . Going back to when he first brought her and moored at old windsor cevall boat yard (no longer there) ,remember the time it took to vanish her and making her look lovely for henley traditional boat rally where she won moveability trails with my dad various states . then on the tideway section of thames in brentford. Hi i to can remember Lady Beryl at crevalds boat yard where we keep our first boat di your dad later own nickols boat yard if so i remember him also as we moored there as well i also remember Lady Beryl moored at sonning on the white hart moorings now called the great house and meet a man who had worked there for some years and said he used to get the boat ready for mr formby and take him for a run i know wonder if this could be true and how long it was kept on the thames did your dad work for john crevald ? Back in the 1960's I lived in Bisham near Marlow. I worked in my school holidays at J.G.Meakes boatyard that was on the Bisham side of Marlow Bridge. One of my duties was to fill the fuel and water tanks of the cruisers that called in. 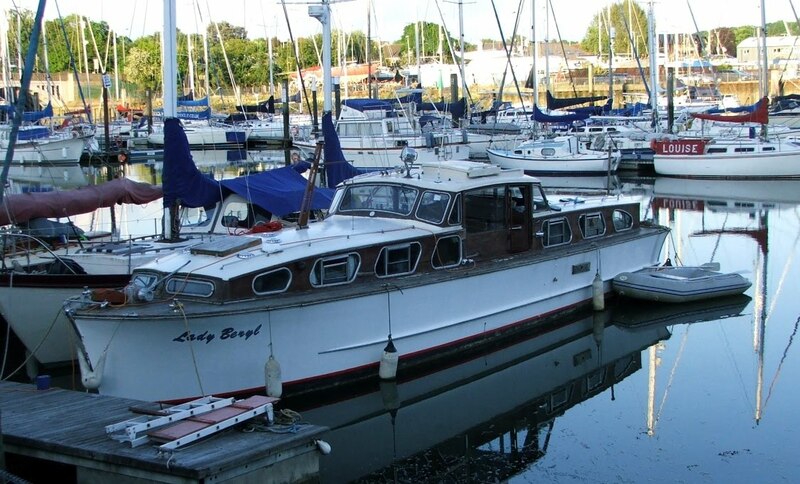 One of the most beautiful was the 'Lady Beryl'I knew that that boat had been owned by George Formby and that the boat travelled up from the Maidenhead and Cookham area to have work carried out. I also remember that boat was very difficult to turn particularly in a strong current while trying to avoid all the rowing crews from the Club next door. I am delighted to see that this stately lady is still loved and in the water. Friends of mine, Charlie and Pam, owned her for a while in the late 80's. I distinctly remember a brass plaque stating that Lady Beryl was used at Dunkirk. But looking at her history, she was built in 1950. Can anyone confirm or deny this? Thanks to everyone who's commented, absolutely fascinating. I forgot about this thread and just came across it again after 7 years. 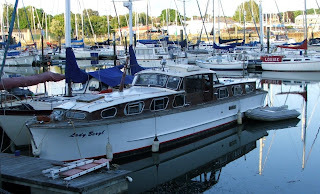 Lady Beryl is still under my custodianship on the Norfolk Broads now, in a wet shed. I moved her up (on a lorry) from the Isle of Wight about 4 years ago. She was in Cowes (Medina Yard) and Newport (Odessa). I would be really interested to speak to anyone who remembers her, as I have big gaps in the history that I can't fill in. If anyone has any pictures that would be even better. I would also be happy to show anyone round the boat if they're interested. I did manage to speak to John Crevald a few years ago, and he managed to dig out a picture of her at the Henley Regatta, she looked fantastic. I'm going to be matching the font for the lettering on the hull when its redone this year. To answer some questions, she was built in January 1950, so wasn't a Dunkirk boat (sadly). I was under the impression that George Formby only used her on the Norfolk Broads, I think she went to London later. She is in the background of photos of the launch of Lady Beryl II if you look carefully which was 1956 (I think). I don't seem to be able to post pictures on here, otherwise I'd put some up of her, including some of the historic pictures I have. My contact is: info@norsondesign.com for anyone wishing to share any history. She is still very much loved. this is so fascinating, i can remeber when i was young the Lady Beryl, my mum and Grandad used to work for a Mr & Mrs Scott, Mrs Scott was formerly Mrs Smith who's hunsband was Mr Smith of Smith's crisps, they had a house on the Thames at Bourne End which they only used a few weeks of the year,and i can just remember being out of the water for some kind of maintenance at Bourne End Marina during this time. i'll drop you a note as i'd love to know more about her, spend many a school holiday admiring her although we were never allowed out on her. They also had a little motor powered boat called the Baby Beryl which they used to get from the house up the river back to Bourne End Marina (where the Rolls was parked. i was still at school during this time so it must have been mid 70's , i can remember a photo my mum had with all it's flags out on the day ther Queen sailed up the Thames during her silver jubilee.